GUELPH, Ont. 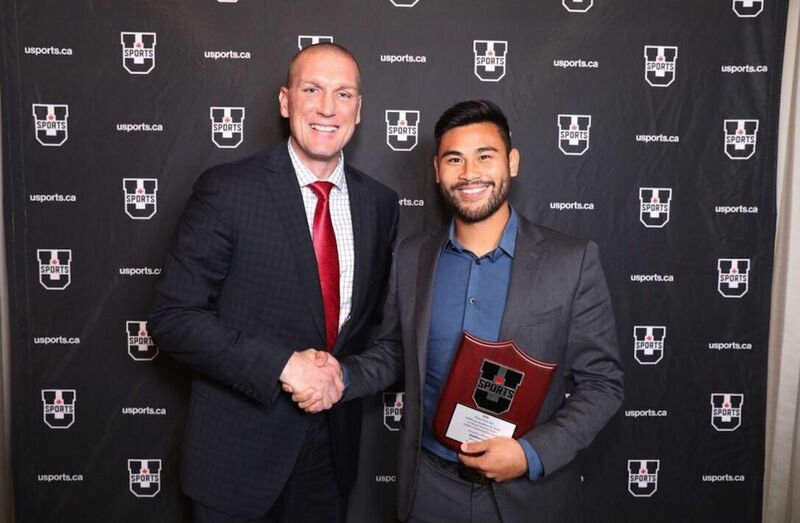 (U Sports) –Jonathan Lao, a fourth-year midfielder from York University, was named the U Sports player of the year in men’s soccer, Wednesday evening. The native of Unionville, Ont., became the second Lions standout to merit the Joe Johnson Memorial Trophy. Other national award winners announced during the All-Canadian Gala at the Delta Hotel & Conference Centre were Ryerson defender Robert Boskovic, who received the Lou Bilek Award as rookie of the year; defenders Jonathan Doucett of Dalhousie and Sanchit Gupta of McGill, co-winners of the Student-Athlete Community Service Award; and Acadia’s Findlay MacRae, who was voted coach of the year. The 2016 CIS championship kicks off Thursday at the University of Guelph and concludes Sunday with the gold-medal final at 2 p.m. All 11 matches from the eight-team tournament will be webcast live on SportsCanada.tv. 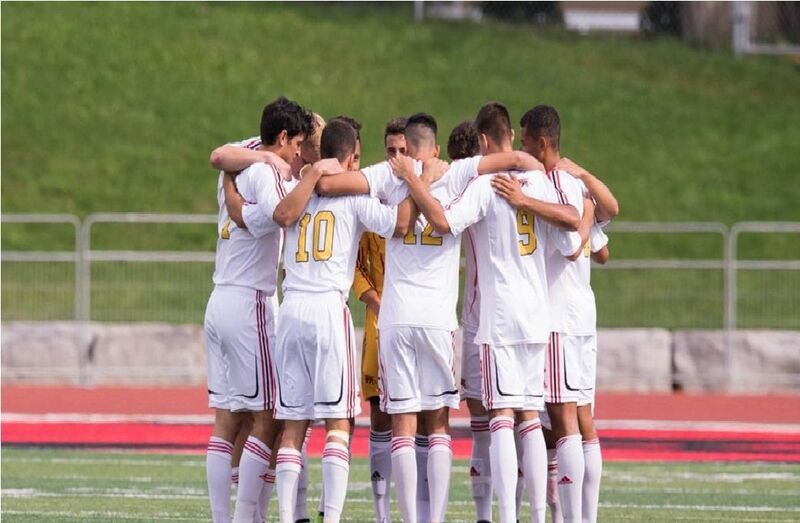 Jonathan Lao has been a dominant force for the Lions in his four years with the program and becomes the second player in program history to be named the U Sports Player of the Year, following Francesco Bruno in 2008. The fourth-year central midfielder from Unionville, Ont., scored four goals and added three assists this season while controlling the play for a team that finished third in the conference in both goals scored and goals against and went undefeated in the regular season. Lao has been one of the best players in the country since he first suited up for the Lions in 2013. Named an OUA and U Sports rookie of the year that season. Lao has been an OUA first-team all-star and a U Sports All-Canadian in each of his four years with York, and is a two-time OUA West most valuable player. Lao has also been named to the CIS tournament all-star team in each of the last three seasons. Playing at arguably the toughest position on the field, Lao’s consistently strong play helped the Lions win three straight OUA championships and back-to-back national titles. The other nominees were Alberta midfielder Ajeej Sarkaria, UQTR defender Louis-Thomas Fortier and Acadia defender Andrew Snyder. Robert Boskovic is the first Ryerson Ram to claim the Lou Bilek award since its inception in 1999. The first year defender started in 12 games for the division leading and nationally-ranked Rams and made an immediate impact. His height, ability to win balls, and composure in the backfield all contributed to Ryerson holding claim to the top defensive unit in the OUA, allowing a league-low eight goals against this season. Boskovic’s ability to transition the ball up the field and find his offensive teammates proved instrumental in the Rams strategy. The Mississauga, Ont. native and former TFC II player finished the year with three assists and one goal. Midfielders Bori Falaye of Calgary and Yanis Zorai of UQTR and goalkeeper Evan Barker of UNB were also in the running. Jonathan Doucett is the second Dalhousie winner of the men’s soccer community service award in as many years, and fourth overall, after Sangmuk Choi took home the honour last season. A fourth-year defender, Doucett has proven himself to be a dedicated U Sports student-athlete achieving academic all-Canadian and Dean’s List status every season he has competed. His ability to manage time and stay focused on his goals has been a key to his success. A nuclear medicine student, he hopes to attend medical school after graduation. In addition to excelling in the classroom and on the field Doucett is also dedicating a tremendous amount of time to community work. A member of the Varsity Council at Dalhousie, Doucett has spent over 1,600 hours volunteering at hospitals in Nova Scotia, working with patients with everything from stress fractures to cancer. He is also involved with the Time Lasts Forever project that studies previously incarcerated male inmates with mental health issues, to develop methods of how to successfully reintegrate them back into their communities. Doucett also spends time organizing Free the Children campaigns to raise funds for under privileged children in third world countries and to educate others on the program and the impact these funds can have. A native of Dartmouth, N.S., Doucett is also very active with the Special Tigers Day program at Dalhousie, providing sporting activities for youth with cognitive disabilities and is a regular fixture at a booth during Dalhousie’s annual White Ribbon campaign, working to end violence against women. Gupta, a 19-year-old science sophomore majoring in biochemistry with a minor in management achieved a perfect grade-point average of 4.0 in his freshman year. He earned a Faculty of Science Scholarship, merited Academic All-Canadian status and made both, the Dean's List and the Principal's Student-athlete Honour Roll. On the field, the 5-foot-10, 175-pound defender has had a tough start to his collegiate career, with concussion and ankle injuries that have limited his play to nine games this season. Off the field, Gupta has taken a leadership role in his team's annual indoor soccer tournament fundraiser and has volunteered as a tutor. He also serves as a volunteer with the Montreal chapter of Mothers Against Drunk Driving and is a member of the organizing committee of Relay for Life, which has partnered with the Canadian Cancer Society. Last February, he joined Enactus, a worldwide organization that encourages businesses to act as an agent of positive change. As part of that group, he helped co-found Meal-care, a student-run initiative that offers meals to the homeless and low-income families in Montreal. The other nominees were Lethbridge defender Cormac Southam and McMaster striker Kristian-Anson Ferreira. Earning the award in his eleventh season at the helm of the Axemen program, MacRae led his squad to a 9-1-2 regular season record, a first-place finish in the AUS standings. MacRae's Acadia squad allowed just four goals against all season for a goals against average of 0.33 per game. The team tied for first in shutouts with nine in 12 games. This is the fourth consecutive year MacRae has led the Axemen squad to the postseason. Over the last eleven years, MacRae has been involved in the local soccer community serving most recently as the head coach of the Valley United Premiere Men's team. His Canadian soccer roots began in Truro as a player with the Nova Scotia Agriculture College soccer club. He then moved his soccer interests towards coaching, acting as a co-coach with the NSAC squad in 1985-86 following his four years as player. Findlay has completed the Canadian Soccer Association's 'B' Licence Program's provincial course. He currently works on the Acadia campus as the director of the Acadia Centre for Social and Business Entrepreneurship. "For a couple of reasons, I couldn't be more pleased this is being awarded to Findlay," said Acadia director of athletics Kevin Dickie. "I can't say enough about him as an asset to our campus, a mentor to young men, ‎a tremendous family person, and as a friend. He's been the foundation of our men's soccer program since its re-inception a few years ago, and the players have taken on his personality of class and professionalism. As an athletic director, I really appreciate Findlay MacRae's extra effort and all he's done for Acadia, on and off the pitch." Alberta’s Len Vickery, Ryerson’s Filip Prostran and Laval’s Samir Ghirb were the other finalists. Joining U sports player of the year Jonathan Lao, conference MVPs Ajeej Sakaria, Louis-Thomas Fortier and Andrew Snyder, and U Sports rookie of the year Robert Boskovic on the first team were UQAM goalkeeper Valentin Lamoulie, defenders Bryan Fong of UBC and Kevin Jean-Michel Le Nours of UQAM, midfielders Raheem Rose of Ryerson and Joel Eckert-Ayensa of Cape Breton and Calgary striker Dominic Russo. In addition to conference rookies of the year Yanis Zoraï and Evan Barker, the second unit for 2016 is comprised of defenders Daniel Pritchard of Cape Breton, Justin Springer of Guelph, Niko Saler of Alberta, Dominick Zator of Calgary, Daniel Gogarty of York and Billal Qsiye of UQTR, midfielders Freddy Bekkers of Dalhousie and Ryan Paris of Acadia, and Laurier Striker Niklas Bauer.